Fact is…some people just don’t and won’t ever like you, but we have this scripture to assure us they may try but they will not be able to war against us. We love to quote the NO weapon formed against you shall prosper scripture- but I am partial to this one. Enemies are sometimes necessary, they serve a greater purpose. They are used to get us to our true destination. Moses would’ve never saw the hand of God part the Red Sea ;if not for Pharoh. And Jesus would’ve never made it to the cross ;if not for Judas. It’s all in how you look at it folks. But I realize now I should probably go back and thank some of those guys because if I would’ve stayed with them, I wouldn’t be in a loving marriage today. God is a God of increase not decrease ,so if there is an enemy out there you best believe God is going to get the glory out of defeating them for you. Ever lost a job? Then God blessed you with MORE and BETTER? yep, that’s the kind of God we serve. Have you ever ran into someone who hasn’t asked for forgiveness but you have forgiven them anyway…notice how humble they seem, yep -that was God at work too. You have no haters when God is your friend. He is a friend that sticks closer to you than a brother, he will never leave you or forsake you, he fights all your battles for you, he blesses you simply because you ask, believing. Your feast is a table full of blessings that your haters get to witness you receiving. They aren’t hostile, they aren’t fighting, they are just watching God bless you. They haven’t realized that the SAME God that is blessing you will also bless them. because of the scripture we read in the beginning God will allow you to pull out a chair for them and offer them a to-go plate. God has taken care of all this for us when we allow him to lead and guide us. 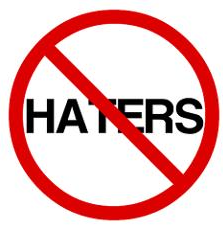 No Haters over here- They are starting to like me, and I am learning to love them because without them I wouldn’t be who I am today. God I thank you for PEACE! Amen….thanks for this inspiration. This one was for me! Thank you so much for reading and always supporting! Hugs!